*This family liturgy time is designed for use outdoors on a warm summer day, when no one will mind getting wet. It’s even better if the water comes as cool relief on a hot night, with everyone dirty from playing outside all day. You will need to adapt the conversation on baptism to your tradition, whether you practice infant baptism or believer’s baptism. Prepare a source of water before you begin — a bowl, a bucket, a glass, a gentle hose, depending on how wet you want to get. This water symbolizes baptism that now saves you also — not the removal of dirt from the body but the pledge of a clear conscience toward God. It saves you by the resurrection of Jesus Christ, who has gone into heaven and is at God’s right hand — with angels, authorities and powers in submission to him. Begin by telling the story of your child’s baptism or, if they have not yet been baptized, perhaps your own story or the story of a family member. Talk about who was there to celebrate the day, the place where the baptism was held, the weather or what everyone wore, and whether there were any special or funny things that happened unique to the day. Ponder together if being dry or covered in dirt is a sign that their baptism is no longer with them. Using the scripture from 1 Peter, explain that baptism is not about the water, it’s about God’s grace. It’s not the water that saves us, it’s the grace of God that we know in Jesus, who loved us enough to go to the cross, to die, and be resurrected. That grace exists for us before we are baptized, and it stays with us after we are baptized — even when we get dry or get dirty again. The water of baptism doesn’t mean we won’t ever thirst for God again, or ever sin again. It does show that God’s grace is bigger than any dirt or drought. Take hold of the source of water and invite everyone remember or to anticipate their baptism. Play around gently with the water. Acknowledge how good it feels — cool and soothing, cleansing and relaxing. No wonder it’s a symbol of God’s grace! God’s grace is what helps us know peace in this world. Ask them if they would like to remember or anticipate their baptism. In a way appropriate to your child’s age and comfort level, get them wet. For a young toddler, a few drips on the head might be best. For a preschooler, you might pour the whole glass of water over their heads. 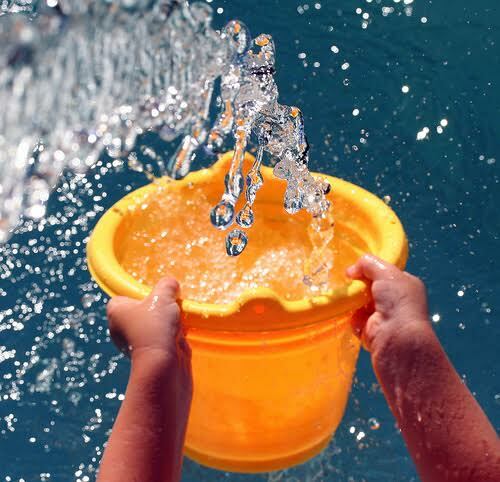 Older children may or may not love having a bucket of water poured over them, or the hose turned on them. (Laughter and surprise are great — fear and frustration are not.) After they get wet, make sure you reciprocate. Tell them you want to remember your baptism, too, and allow them to get you wet in return. Be prepared to get just as wet as they are — if not wetter! After everyone is good and wet, remind them about how good it feels to be washed in God’s grace, cool and refreshing. Even though eventually all will get dry or dirty again, there’s always more water, always more grace. as a way to understand and know your grace. for providing moisture when we are all dried up. Amen. Tags: baptism, grace, summer, water. Bookmark the permalink.